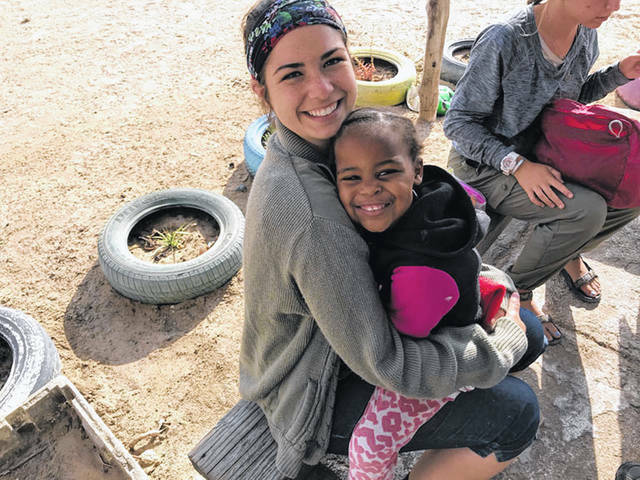 Jessica Witer, left, of Anna, gets a hug from a student in Namibia, where Witer completed a mission trip earlier this month. Jessica Witer, third adult from left, poses for the camera with mission friends and Namibia residents. 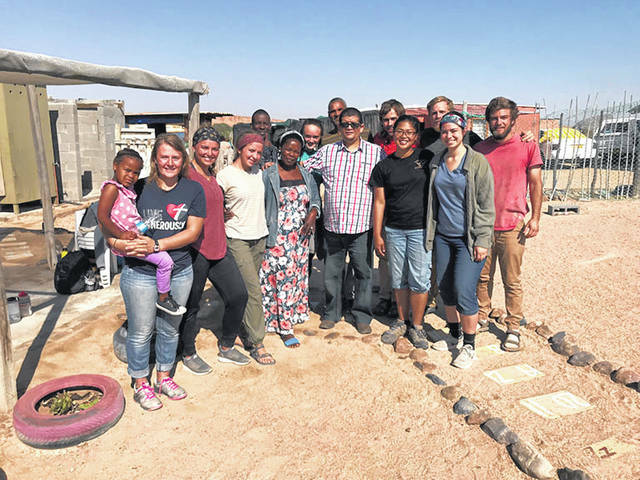 Editor’s note: Jessica Witer, of Anna, returned Friday, Aug. 10, from a summer in Namibia, Africa, on a mission trip. The 22-year-old, self-employed massage therapist traveled with Experience Mission, of Fort Wayne, Indiana. As she was able and had access to the Internet, she sent tales of her experiences, which the Sidney Daily News will continue to publish weekly until her story is fully told. WALVIS BAY, Namibia — Most mission trips have a physical goal: build a school, deliver the medicine, raise X amount of money. Ours is more of an emotional or spiritual goal: connect with the people, display the love of God, strengthen the pastors. Physical goals are nice, because you can go home and show people the photos and say, “This is what I accomplished.” But when a country’s problems are not material, material things cannot save them. The root of Africa’s troubles stems from their idea of “god,” and when we show them, instead, “God,” we can make a long-term cultural change. It may take five, 10 or 100 years to see the fruits of our spiritual labor, but these are the solutions that make a more meaningful and permanent impact on a nation. We spent our time in Okahandja singing to elementary students, sitting and talking with high school students, holding the hands of nursing home residents, praying over people in hospitals and preaching to people in prison. Through this outreach, we are sparking change in people’s hearts. Whether we say something that sticks with them or they’re simply changed by being shown love by white Americans — something many poor, Black people in this part of the world would never expect — our goal is to bring people to Christ, and this is how we accomplish it. One thing many of my teammates and I have had to come to terms with is not having control. What we wanted was to meet a few people and help them grow in their faith as much as we can. We wanted to tell them about our faith, then teach them the details, then bring them into the church, then help them become strong believers. This is not reality. We have to settle for doing a little, then allowing God to do the work in their hearts, Himself. We had to learn to be OK with letting go of the reins, to accept being only one small part of the picture. We couldn’t hold someone’s hand for the whole process. Different community members and future teams could handle the responsibility of taking struggling people another step. While it was difficult to do this, God does not call us to be saviors. That’s His job. Deuteronomy 7:22: The Lord your God will drive out those nations before you little by little.